North Carolina workers’ compensation, like most areas of the law, has specific meanings for specific terms. In order to understand your eligibility for workers’ compensation benefits and the amount of benefits that you should receive, you need to know what the terms mean. Sometimes, the terms may not mean exactly what you think they should mean. Average weekly wages. Generally, your average weekly wages will be the amount of your earnings, in the employment in which you were working at the time you were hurt, for the 52 weeks immediately preceding your injury divided by 52. However, there are some important exceptions to these general calculations that may be applicable and should be discussed with your workers’ compensation lawyer. Employment. Employment includes working for the state or a private employer as long as three or more employees are regularly employed in the same business or establishment. There is an exception to the three employee rule if you work with radiation or if you work in agricultural or domestic services. Employee. An employee is someone engaged in employment, unless that person is an independent contractor. The term employee specifically includes both aliens and minors whether or not they are legally employed. Independent medical examination (IME).Your employer or the NC Industrial Commission may require that you submit to an independent medical exam by a qualified physician at a reasonable time and place. While you may have to attend the independent medical examination, you do have certain rights that are meant to protect you during an exam with a doctor whom you did not choose. Injury. Injury, or personal injury, only means an injury arising out of and in the course of employment. Occupational disease. An occupational disease may be a particular disease that is specifically included in the North Carolina statutes or an illness that developed because the worker’s employment was a significant factor in the disease development and exposed the worker to a greater risk of developing the disease than the public generally has of developing the disease. Permanent partial disability. A permanent partial disability is an enduring disability to a body part(s) that allows an employee to keep working to some degree. Temporary partial disability. A worker may be able to go back to work after an injury or illness, but may not be able to work as many hours or work a job with the same pay immediately. Temporary partial disability benefits may be available for a worker in this situation. Temporary total disability. 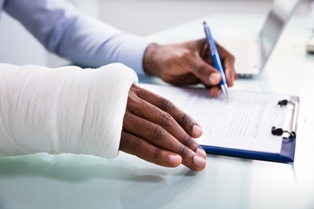 A worker may be unable to work at all for a certain amount of time after a workplace injury or illness and may be able to recover temporary total disability benefits during this time. Total and permanent disability. An occupational injury or disease may result in a total and permanent disability if the worker is unable to engage in any suitable employment for the rest of his life. Additional terms, including some medical terms specific to your injury or illness, will be important to your workers’ compensation claim. Your workers’ comp benefits depend on an accurate understanding of the law. To learn more about the specific benefits that you might be able to receive after a workplace injury or illness, please contact an experienced workers’ compensation lawyer today for a free, no-obligation consultation. We also invite you to download a free copy of our book, How to Get Top Dollar$ for Your Workers’ Compensation Claim, to begin getting the information that you need right now.